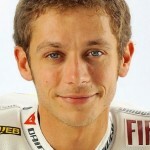 Valentino Rossi is a professional motorbike racer, born in Urbino, Italy in 1979. He has won the World Championship nine times. I have very nice recent memories of Silverstone. Last year I won a really incredible race in very difficult conditions. I hope that this year there will be nice weather, but from the climatic point of view the English race is very uncertain. I like Silverstone a lot, it’s a very fun track but also very demanding. This circuit is very long and there are many changes of direction with high speeds. It is important to find a perfect set-up for the bike to be able to suit both the slow and the fast corners. We will try to work on all aspects, as we have been doing the entire season to get the best possible result. Rossi says he wants to race with a new Yamaha chassis and swingarm following 60 test laps (equivalent to four race lengths) at Brno. In the end it was a good day. This morning everybody was a little bit sad because the condition of the track look quite bad. And when I entered the track – we decided to go anyway because we had some important things to test – the lap time was quite high. But after, when 4-5-8 bikes were on track, it cleaned and for the last two hours it was a very good test. A very good level. Because we can push, go fast. Also the time attack at the end was not so bad. But especially I like the new stuff. We tried a lot of different things, especially a different chassis and different swingarm. And I like. The feeling with the bike improved and I can enter the corner faster. I also like the bike in braking. No – because of too many mistakes, being a little bit unlucky and I’m too far [behind]. And also Marquez this year is not only fast in all of the conditions but he makes always the right choices. So it’s very difficult to close the 53 points. We can be strong and we won’t give up to the end, but I think it’s very difficult. [But] the fight with Lorenzo for second place is very open. It is very important to gain these points and stay in front, but at the same time Lorenzo is very strong, very fast. The conditions were very different compared to this morning, this morning there was a lot more water. On the grid there was a little bit of confusion, to understand the tyre choices, [and] if somebody changed. It was a risk, but at the end we tried. Unfortunately we didn’t also put on the hard front, I wasn’t brave enough like Cal. The first laps were a nightmare, I made a mistake a lot of times and everybody overtook me from the outside and the inside. It was difficult. But from one point I understood that maybe it wouldn’t dry enough for a flag-to-flag race, and from that moment I understood that maybe my choice was better [than the soft rear]. Then Cal overtook me and I saw that he was very fast, and I knew that he had the hard, so I just tried to ride well, not make any mistakes and it was great fun, the second half. Rossi takes second place in the Czech Republic GP at Brno. After starting from sixth place on the grid, he drops back to 12th place. However, his tyre combination (soft front/hard rear) begins to pay dividends as the track dries out. With seven laps to go he overtakes Marc Marquez to take fifth place; with five laps to go he overtakes Hector Barbera, and shortly thereafter overtakes Andrea Iannone to finish behind race winner Cal Crutchlow. Rossi overtakes Jorge Lorenzo in the World Championship, trailing Marquez. At the beginning I was desperate because I think we had made a mistake. But lap-by-lap the rear was coming back. I had to concentrate and not make any mistake…It was a great race I’m very happy with this 20 points, because I am second in the championship. I think that today we did a good job and we made the right choice. Rossi places sixth on the grid for the Czech Republic GP, 0.913s behind Marc Marquez in pole position. Rossi says riders were not adequately informed about the Czech GP track limits. Including Rossi, seven riders had lap times cancelled in first practice for using a small section of the Brno track surface at the end of the final corner’s exit kerb, which had been deemed off limits. Infringements against eight riders were also recorded in the second session, again including Rossi, with 12 different riders, including Marc Marquez, getting penalties over the course of the day. Riders will ask for the section to be painted red, to make the limit clear. It was not clear, simply because nobody said anything to us, Usually the track limits is that if you go over the kerb, but in this case a lot of riders had the lap cancelled because the kerb finishes but we still have some asphalt. I understood the situation in the afternoon, so I tried to stay one metre inside, because I didn’t know that after the kerb that asphalt is off of the track. It’s still very long because there are eight races and at this moment you can have seven riders who are very strong who can fight for the victory. It depends very much from one track to another, so we have to try to be competitive and try to always be on the top. For us it is a great shame that we already have this disadvantage compared to Marc because we did some mistakes and also we were a bit unlucky. We have a good potential but we are quite far, so at this moment for us we need to do also something extra because we have to go faster but we have always to take points. We have to take it race by race and try to do the maximum because I think from here to the end it will always be a great fight…Also the speed of the Hondas [will be a factor] with Marc but also [Dani] Pedrosa, who is very strong in Brno, so all the top guys are in good shape. It’s a great track, I like it a lot and it is the race of my first victory, which is something unforgettable. Rossi says he supports the introduction of a MotoGP dashboard messaging system in 2017. The ‘virtual boarding’ system under development lets teams to send pitboard-style messages to a rider’s dashboard. Testing is slated to start at the Aragon round next month. It’s good, I like it. During the race, especially in flag-to-flag, it can be a help. Also it can be good for safety – if you have a crash in front, or a yellow flag, or some people have a problem with the engine and there’s oil. Also because I always make the wrong decision! Maybe with the message in the dashboard it’s more easy. Rossi finishes the Austrian GP in fourth place, behind teammate Jorge Lorenzo in third. Rossi and Lorenzo trail the two Ducatis of race winner Andrea Iannone and Andrea Dovizioso through most of the race. To arrive three seconds from the Ducati is a great result. We worked well and were quite competitive at a track that is not fantastic for our bike. But I’m not happy with fourth place, because my target was to arrive on the podium. The great shame personally is that Lorenzo arrived in front and also that we don’t fight. I want to try to make some overtake and fight for the podium, but it was difficult in braking and also on the exit of the corners. So the situation for me personally was not 100% under control. I had to risk too much. Every time I tried to get closer, I made some mistakes and at the end I finish just fourth. Rossi takes second place on the Austrian GP grid, 0.147s behind Andrea Iannone, and ahead of Andrea Dovizioso and Jorge Lorenzo. I’m very happy to start on the front row and also because I was able to split the two Ducatis. It’s important to start from the front row, but now we have to wait for tomorrow – the conditions, the temperature and especially the tyre choice will be very important, because it’s open, especially for the rear, soft or hard. We have to put one eye on the front, I hope, to try to stay with [the Ducatis], but also one eye on the second row, because on the second row we have Lorenzo, Marquez and Vinales, all three have the pace to fight for the victory. The strongest six riders of the season are all in the first two rows, so it can be a good battle. After finishing FP2 in fourth — 0.866s back of pace setter Andrea Dovizioso, and 0.6s off Andrea Iannone — Rossi says that he is concentrating on Ducati slipstream and fuel. We have to just give the maximum, try to fix all the small details to go a bit faster on the straight. But you know, is very difficult to go faster on the straight. You can try to exit faster from the corner, but on the straight, the level is what it is. But you never know. It’s just Friday, we have Saturday, and especially the race is always different. It depends very much if we are able to keep the slipstream of the Ducati. 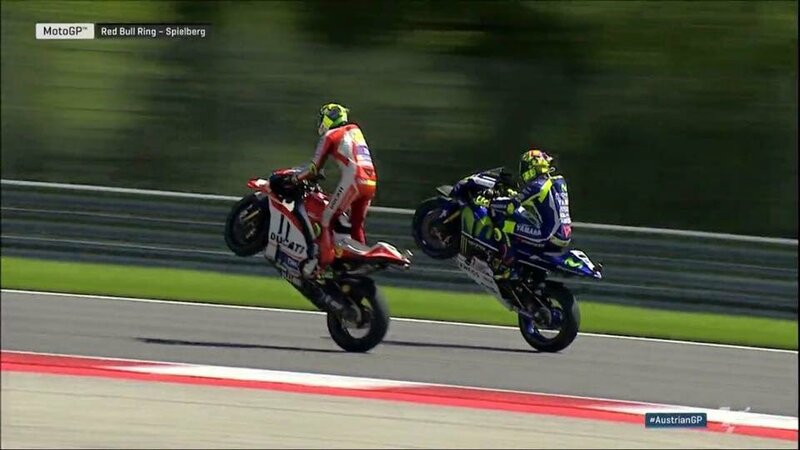 The Ducati have a lot of horsepower, but what they are able to do better compared to the Yamaha and Honda is less wheelie. For this reason, they are very fast in acceleration. Because it looks like the bike accelerates more with less wheelie on the front. So for this reason it’s very difficult. It’s too early to say if we can fight with Ducatis. For me, for sure is more more important [Jorge] Lorenzo and [Marc] Márquez than the Ducati, but I don’t want to start just for third place. It’s too early. We have to try to stay with them. Also because 28 laps are very long. Rossi says he is concerned about Turn 8 of the Austrian GP at Spielberg. Organisers took the decision to modify the final corner, Turn 10, by making the track narrower to reduce the risk of a serious accident by distancing the riders from the outside wall. This track is very fast, and when a track is fast it’s always dangerous. Especially the exit of Turn 8 remains very dangerous. On a normal lap, you go through it quite easily, but it’s [taken at] very high speed and the wall is quite close. This for me is the most dangerous point that we have to try to improve in the next years. Rossi talks about the Austrian GP track at Spielberg, where he had his first podium on the international finish, in 1997, as a 17-year-old. It is a wonderful memory, my first podium was great and I could not have imagined what followed it. The track is similar to 20 years ago, when I raced with the 125, but the asphalt is new and has very good grip, it is very flat with no bounce. The track is so fast. I think it’s different to the other ones because you stay on the throttle for a lot of time, so maybe it will create a different kind of race. The gap of 59 points is hard to make back. In the last few races we have lost many points but we have to be strong and have the concentration to always get on the podium. The distance [to Marquez] is almost irretrievable. I will concentrate on these nine races and try to make more points than in the first half. We are starting an important moment of the season, because we have four races in five weeks and also five races in seven weeks. It’s good, because after Barcelona we had a long stop from one race to the other. That is not fantastic, and after the summer break I prefer it like this. Rossi says the impact of MotoGP’s new-for-2016 tyres and control electronics on bike set-up has been smaller than he anticipated. We tested three or four times with the Michelin tyres last year and this gave us a lot of worries because we were slow, we crashed, we didn’t have feeling with the front. Yamaha worked to develop a [new] bike that is quite different compared to the year before with the Bridgestone, with the different weight distribution and the [fuel] tank on the rear. But the Michelin tyres improved a lot, especially the front and at the end, essentially we are using a very similar set-up compared to Bridgestone, and this is good. With the electronics, we expected a big revolution, a big step back, but at the end it was a half-step back. The bike that I am using now is very similar to last year. Valentino first believes that the merchandising is the link between the sportsman and his fans. He gave us very few rules. The first one is ‘never compromise on quality”. Rossi improves from ninth to fifth on the final day of MotoGP testing at the Red Bull Ring, in Austria. The race will take place August 12-14. I raced here in ’96-’97 – a lifetime ago! – but the track was the same and it’s a great feeling [to be back]…It is a particular type of track. Very, very fast and you stay a lot of time at full throttle. There are just nine corners but sincerely speaking I like the track and it’s good to ride. But unfortunately on the performance side it is not our track, because usually we suffer a bit with top speed and in the straight we lose quite a lot. We were able to improve the lap times and our position today and we’re a little bit closer to the top guys. But it will be a very difficult race, especially with some of our factory rivals; they are faster than us. It was a difficult day because the weather was very bad. This made everything more difficult, and also more dangerous, because also the soft option for the front [tyre] is a bit too hard for this temperature. This morning, I had a quite good feeling, but after it started to rain. In the afternoon, we tried something different and also I have to work only with used tyres, rear and front. But anyway, our potential is nothing special. Looks like today, all the Yamahas are struggling with the front. We don’t have enough feeling with the front, especially on the right, especially at Turn 11, but also on the other right corners. At the end, I wasn’t able to make a lap pushing at 100%. So I am in a bad position…This track is a particular track because it’s very tight, especially the first part and it is the only place where you stay 25 seconds on the left. And sincerely, it is physically very demanding, because staying for a long time on the left is difficult. Also the track is short and you have to do 30 laps in the race. But for me Assen, or other big and fast tracks, are more difficult. In the end, this track is not so bad, the bigger problem is it goes left, left, left… and then right. So every lap we arrive [at turn 11] is very scary. Apart from that, the rest is good, I like the track. Rossi says he is confident of success at the German GP. I really want to get back on track. Over these last few days I‘ve rested at home, but now I want to leave for the race at Sachsenring. In Assen we worked well throughout the weekend and we were really fast, both in wet and dry conditions, but the race was not very lucky for us. At the Sachsenring circuit we will have to work well as we have been doing during all weekends this season. We are fast and I‘m comfortable with the YZR-M1 and with the Michelin tyres. I like this track and Sunday I will do my best to make it a good race. 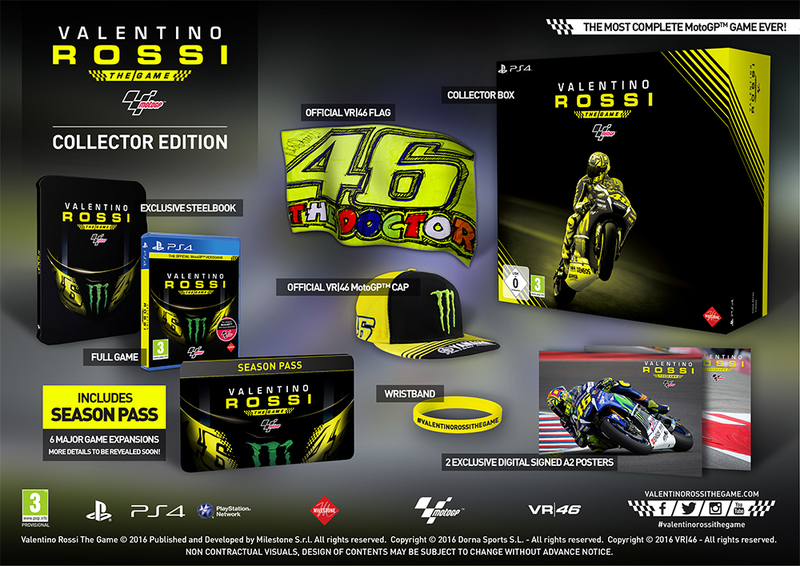 Monster Energy release the fourth episode of their Valentino Rossi: The Doctor series. This episode examines Rossi’s impact and influence through two decades of MotoGP, and some of his memorable trackside gags. I race always with number 46. It’s important for the fans to recognize. I see a lot of babies love 46 because it’s yellow. 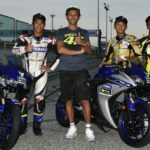 The Yamaha VR46 Master Camp riders spend the day on the nearby Misano circuit for some asphalt laps on Yamaha YZF-R3 bikes. The pupils ride against Rossi, the VR46 Academy Riders and other guests, before being given some clear track time for themselves in a timed practice session. Again another great day together with the riders of the Yamaha VR46 Master Camp. This time we found ourselves at the Misano World Circuit, and these were three hours of very intensive training. Some of the VR46 Academy riders have followed the Asian riders on the track and at the end of the day I saw them riding really well. I too have crossed some of them on the track during training and I was impressed with how well they are picking up on our teachings. [Friday] is the last day of Master Camp. We will end this very exciting week in a really nice way: on track with minibikes! We are only at the halfway point of the first Yamaha VR46 Master Camp and already I see the guys are very happy. They are having fun and are interested in whatever is being taught to them and this allows them to learn everything very quickly. They are doing different exercises to gain experience during this Master Camp…They are really good with the flat track bikes and they go very fast! I did several laps with them and I like how they ride! They also had a race and I enjoyed watching them on track, fighting for the glory to be the champions of the first Master Camp race at the Motor Ranch. Rossi’s Master Camp officially starts. Having passed a medical, efive young riders, who are currently racing in motorcycle championships in Asia, Thailand, and Japan, will take part in a 5-day program designed especially for them, with theoretical training and on-track practice with expert trainers, including Rossi himself. 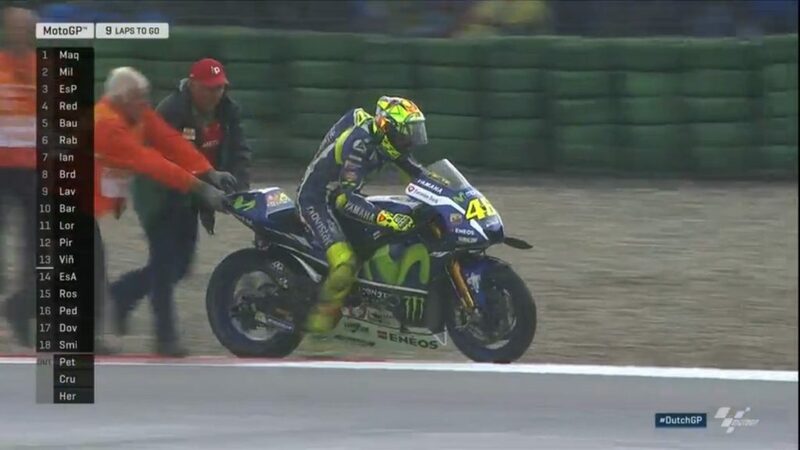 Rossi crashes out from his lead in the second lap of the restarted Dutch GP. Despite trying to restart the bike, he cannot re-enter the race. I was a dunce, maybe even something worse … but I think that word will do. It’s a real pity. I had a good chance of bringing home some heavy points. On the dry I had a good pace, but I was doing well even in the wet. I had gotten off to a good start. I could have won. In the second lap I had widened the gap a bit and I wanted to keep pushing for another lap, but instead I made a rookie mistake. With the soft tyre I was able to be fast from turn 9 and I arrived at the braking point on turn 10 4 or 5 kph too fast. It’s one of the worst mistakes of my career, because the one in Austin could be expected after a lot of races. This one, on the other hand, is a rookie mistake. It’s disappointing to make a mistake when you have a chance of winning, when you’re up front with a gap, because it would have been enough just to be a bit more careful, to go a bit slower. The bike switched off. It has a safety system to prevent the engine from being ruined. Then the race marshals didn’t help me, but I was in a bit of a dangerous spot and they were right. In any case, it wouldn’t have changed much. I would have finished with very few points. The Dutch GP is stopped on Lap 15 of 26, due to rainy conditions. Rossi is in third place, behind Andrea Dovizioso in first place, and Danilo Petrucci in second. Scott Redding is in fourth place. Starting from second place on the grid, Rossi was behind Yonny Hernandez and Dovizioso until the Columbian crashed out in Lap 11. The race will be restarted if conditions improve. 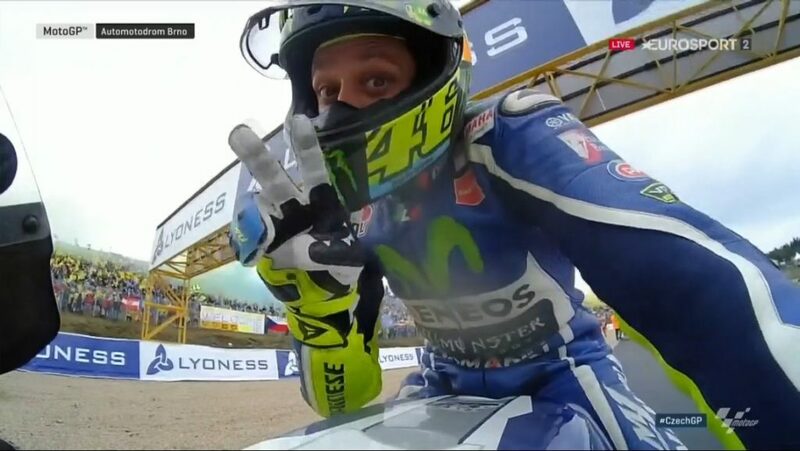 Rossi takes second place on the grid in Assen, trailing Dovizioso by half a second. Scott Redding is third. I stopped at the pit box four minutes before the end of the session, because my rear tyre was already getting too hot, because there were some places of the track that were starting to dry. For me it was too early to change to the intermediate tyre because three or four corners were still completely wet, so we put in another rain tyre and it was the right choice. It’s a shame for me that I’m not in pole position, but above all I’m happy for the second place and starting from the first line tomorrow. Rossi comes second in Friday’s second Free Practice session in Assen, Netherlands, behind Andrea Iannone, and in front of Marc Marquez. 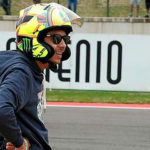 Rossi tested two versions of his M1 bike. In the earlier practice session he had come seventh. It was a good day and I’m quite satisfied. This morning I had a small problem but in the afternoon we improved the setting of the bike and we improved my speed. In the end Iannone just beat me by 0.004s, but I’m in second place so I’m quite happy. We compared the chassis we have tried during the Barcelona test another time. The difference is not so big but in the end I prefer my standard frame. Rossi says he feels more competitive than in 2015. The important thing is to be strong and fast on Sunday afternoon at 2pm. This is what I’ve been thinking all my career. Last year I fought for the championship to the last race but sometimes in the race I wasn’t fast like Lorenzo and Marquez. This year it looks like I’m stronger even if it looks like I have less points. It’s a good moment, I like my bike, the Yamaha is very competitive, I like a lot the Michelin tyre because it’s something I used a lot growing up, so it’s something very familiar. I think we are there at the same level, very fast like Marquez and Lorenzo, but at the same time also [Dani] Pedrosa, [Maverick] Vinales and [Andrea] Iannone are very strong…But there is still 11 races to go, so the important thing is to work and try the maximum. Only a few months ago the partnership between Yamaha and VR46 began and it brought the guys of the Academy some fantastic bikes for their training, on track and at the Ranch. This was already a great step towards helping young talent, but today I am even happier when thinking about the start of the first edition of ‘The Master Camp’, which is only a few weeks away…They will spend an entire week with us, train with us, following the same programme every day, on track and at the gym. It won’t be easy for them, but I’m sure we’ll have fun! It will be a beautiful and busy week! 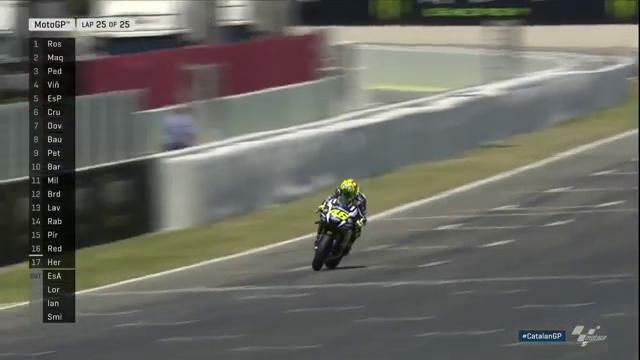 Rossi wins the Catalunya GP. With 20 laps to go, Rossi moves from fifth place on the grid to take the lead. Marquez takes the lead with five laps to go, but Rossi comes back in the second last lap, to win. It’s a great, great victory. One of the best my career. And it was for [Luis] Salom.